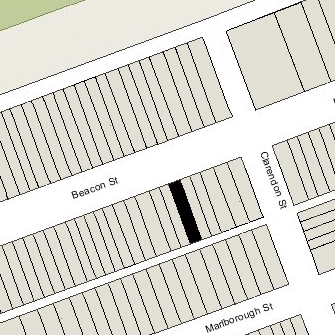 215 Beacon is located on the south side of Beacon, between Clarendon and Dartmouth, with 213 Beacon to the east and 217 Beacon to the west. 215 Beacon was built ca. 1866 for merchant, cotton manufacturer, and real estate developer Charles William Freeland, for speculative sale, one of five contiguous houses (211-213-215-217-219 Beacon) designed as a symmetrical composition, with 211-213 Beacon and 217-219 Beacon having shared porticos and full bays, and 215 Beacon, in the center, having no bay. Originally numbered 199-207 Beacon, they were renumbered 211-219 Beacon by 1868. Click here for an index to the deeds for 215 Beacon. On April 30, 1870, 215 Beacon was purchased from Charles Freeland by attorney Henry Clinton Hutchins, He and his wife, Mary Louisa (Grout) Hutchins, made it their home. They previously had lived at 79 Pinckney. They also maintained a home in Milton. Henry Hutchins’s niece, Julia (Hutchins) Hale, the widow of Horace Reed Hale, and their daughter, Kate Hale, lived with them. Mary Hutchins died in January of 1883. Henry Hutchins continued to live at 215 Beacon until his death in October of 1894. Julia and Kate Hale continued to live there in 1895, but moved soon thereafter to an apartment at the Hotel Royal at 295-297 Beacon. On January 1, 1895, 215 Beacon was acquired from Henry Hutchins’s estate by Dr. Frederick Lafayette Jack. His brother, Dr. Edwin Everett Jack, and their parents, retired masonry contractor Lafayette Jack and Sarah Jane (Shaw) Jack, lived with him. They all previously had lived at 437 Boylston. Frederick Lafayette Jack was a physician and lecturer on Otology at Harvard Medical School. He later became aural surgeon-in-chief at the Massachusetts Eye and Ear Infirmary. Edwin Jack was an ophthalmologist. They both maintained their medical offices at 215 Beacon. Lafayette Jack died in March of 1906. Edwin Jack married in December of 1916 to Mary G. Denny. 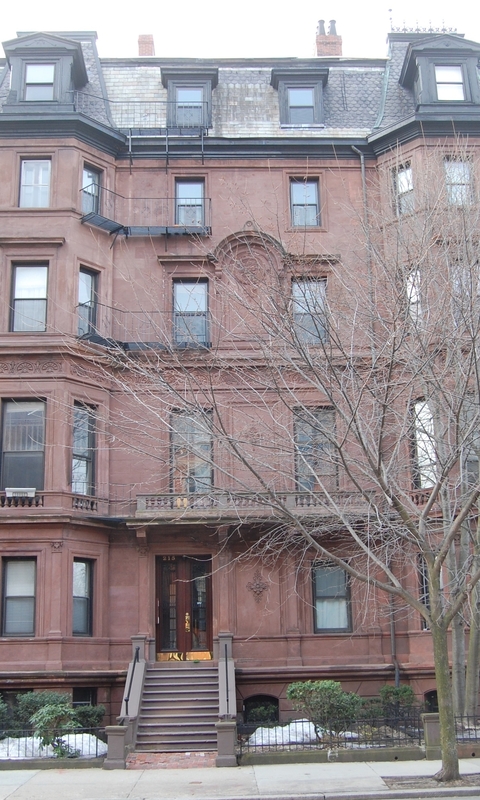 After their marriage, they lived in Brookline He continued to maintain his office at 215 Beacon with his brother until about 1936. Sarah Jack died in February of 1924. Frederick Jack continued to live and maintain his offices at 215 Beacon until his death in May of 1951. On November 3, 1952, 215 Beacon was acquired from Frederick Jack’s estate by Ella Frances (Brennan) Wasserman, the wife of real estate dealer Samuel Wasserman. They lived at 167 Marlborough. Ella Wasserman’s mother, Sophia Annie (MacDonald) Brennan, the widow of Donald C. Brennan, lived at 213 Beacon. In December of 1952, Samuel Wasserman filed for (and subsequently received) permission to convert 215 Beacon from a single-family dwelling into nine apartments. On February 15, 1959, 215 Beacon was acquired by Alexander N. Bronsten and Leonard Baron. The property changed hands and on October 7, 1971, 215 Beacon was acquired by Andrew Saggese, Jr., and Anne Dolce, trustees of the A & D Realty Trust. Andrew Saggese subsequently acquired Anne Dolce’s interest and on June 22, 1973, transferred the property to himself as trustee for the Fidelity Realty Trust. On August 3, 1975, the building was damaged by a fire on the fifth floor, which was vacant at the time. On August 6, 1977, 215 Beacon was acquired from Andrew Saggesse, Jr., by Laurence Thomas Plante and his sister, Mary Christina Plante. He was a research biologist and was a professor of biochemistry and pharmacology at Tufts University in the mid-1970s. On January 17, 1978, 215 Beacon was acquired from Laurence Plante and Mary Plante by real estate broker and investor Patrick J. Glynn. He also owned 211 Beacon, 213 Beacon, and 217 Beacon. On January 22, 1991, Patrick Glyn transferred the property to himself and his wife, Anne T. (Kelly) Glynn, as trustees of the 215 Beacon Street Trust.